First, the clockmaker must diagnose why the clock is not working properly. More often than not, he is going to do this without the benefit of long term testing and monitoring of the clock. He needs to be able to examine what he can see of the movement’s condition and combine that information with what the clock owner is telling him they are experiencing. There are an innumerable number of problems a clock might have and the clockmaker needs enough experience to determine the cause in order to give the customer an accurate estimate of the cost of the repair. Needless to say, diagnosing the cause of a clock’s problem is not a perfect science. A clockmaker’s ability to do this accurately is largely dependant on his experience. Sometimes the diagnosis is obvious, other times it is not. What a clockmaker finds easiest to estimate is a clock with little or no wear, or one that is badly worn. 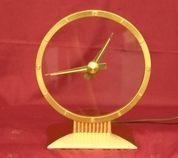 A clock in good condition may need only a minor repair such as a cleaning or oiling. A clock in bad condition usually needs to be overhauled. Unfortunately, sometimes appearances are deceiving. Clocks that “appear” to be in good condition when assembled, once cleaned or taken apart, may be in far worse condition than expected. This is the difficulty in properly estimating a clock. What does the repairman do when the clock’s condition falls somewhere in the middle, between being in really good non-worn condition and badly worn? Does he recommend an oiling, a cleaning, or an overhaul? The only option that does not involve a risk to the customer is the overhaul, because an overhaul comes with a guarantee, so that must be the right answer....right? I’m not always so sure. For the following discussion it is important to remember what type of clock we are now talking about here in terms of condition. We are talking about a clock that has some wear but may not be worn out. What if by looking into a “crystal ball” we could determine that the clock would run another ten years with just a cleaning and oiling? Would the overhaul be the right answer? I don’t think so! In this case an overhaul is more than the customer really needs at this specific point in time. Unfortunately, there is no crystal ball that will allow us to do this, but that doesn’t mean that some of these clocks, somewhere between worn a little and worn a great deal, might run another five to ten years or more. Once again, this is not a perfect science. With no crystal ball in sight, what is the clock repairman to do? Once again, there are basically three different approaches to this question. The first approach or “philosophy” is usually born out of improper training and or lack of experience. This philosophy usually centers around the clock needing to be cleaned as this is the limit of the individual’s level of skill. Because of this it appears to him/her that this is always the proper diagnosis; the clock is dirty. This person is unable to recognize that a clock might be worn out. More often than not, this person is afraid to dismantle the movement because he wouldn’t know what to do with it, and if he did take it apart, he wouldn’t know how to get it back together. This approach is going to work some of the time. Woe be to the customer whose clock movement is now clean but still will not run! The other extreme or opposite philosophy is that any old, antique or even slightly worn clock must always be overhauled. (Sometimes an old clock that appears to be in really good condition really is in good condition, because it was manufactured specifically to be durable.) A clockmaker with this philosophy believes that he is protecting his customer because if he does not overhaul the clock he is more than likely not going to guarantee the job. In one sense this is true. The other thing this person is trying to avoid is an upset customer who pays for a cleaning that does not work, because it really did need an overhaul. I used to agree with this concept because it does make some sense. However, I feel the person who is protected the most is the clockmaker, not the customer. Remember our “crystal ball”? What if the clock really did not need to be overhauled? Are customers protected when charged $350 for an overhaul when perhaps a cleaning for $125 would have been sufficient? They got what they paid for, but did they get what they needed? I cannot in good conscience automatically always recommend an overhaul in this situation unless I am quite sure the clock needs it. That does not mean that I won’t suggest it. To imply however that it is the only option, is in my opinion, wrong. This then leads us to the last philosophy I will discuss. Like Goldilocks who found one bed too soft, one bed too hard and one just right, that is how I feel about my philosophy, it’s just right, not only the right approach, but the right and honest thing to do. What do I do? I inform. A customer may not always know what is best for their clock, but a customer knows what is best within their circumstances. Because of this I give my customers options where it is appropriate. I try to educate my customer so that he or she knows the clock’s condition, the repair options, the potential risks involved, if it is likely that the estimate might change as the work progresses and whether there is or is not a guarantee. I explain the difference between cleaning a clock and restoring a clock. By doing this the customer is better able to make an informed decision. The majority of my customers appreciate this approach. Let me make it clear when I say, “The customer knows what is best for their circumstances”, that I do not mean that I let the customer tell me what the clock needs. What I mean is that the customer knows how much money he or she has available, their tolerance for risk, the value they place on the clock, and whether they are thinking for the long or short term. This approach causes me to spend more time with my customer. More time at the front counter means less time at the bench performing repairs. When I have discussed this with other clockmakers I know, they invariably say that they cannot afford to operate this way as it takes too much time. Unfortunately for the clock owner they sometimes get a repair that is much more than they actually needed. This is why what I do is quite rare. If you want to know which clockmakers operate this way look for signs that say “All Repairs Guaranteed”? This sounds like a good thing right? Not necessarily. This means they are always forced to push you into the most complete repair they offer. I can always guarantee my work but I cannot guarantee all my repairs. What is the difference you ask? If you choose a minor repair on a slightly worn clock I can guarantee that the work I perform (cleaning or oiling and adjustment perhaps) was done correctly. What I cannot guarantee is that the work performed is adequate if the customer chooses the minor repair over the major one. It may be that this slightly worn clock really does need to be completely rebuilt. We will not know for sure until I attempt the repair. This is why the risk would be explained to the clock owner in advance. Some people would rather not have to make the decision between a cleaning and an overhaul. They expect me to know what should be done because I am the professional. For this customer I would more than likely recommend the overhaul. This takes away any uncertainties concerning how the repair will turn out. I know the clock will be in great shape when I am done, and the customer knows he is going to get a guarantee. I feel good about offering the overhaul because the customer did not want options; the customer wanted the clock in optimal working condition. This is how I approach the variables involved in the process of clock repair. Other clockmakers may agree with me and others won’t. That’s okay with me! If you affirm the rationale in this approach and you have a clock needing repair, I welcome the chance to serve your clock repair needs.